At the end of our review period, he was tasked with applying the principles learned in the book to create his own work of 3D art. He chose to create a clay statue of our dachshund, Brutus. This particular project used the coil method from unit 2. He also made a ball for the dog using a method from Unit 2 that covered how to make a pinch pot. During the process. You're supposed to use a canvas mat, but I had wax paper on hand. It worked out well for us. You are supposed to paint it or clear coat to seal it. My son doesn't want to paint it yet. He can't decide how he wants to paint him. Mr. B made, kitty approved! My sorry attempt at Pinch pots. I felt the need to share lol! I am going to paint these to match some new decor. And yes, I fully intend to use them! 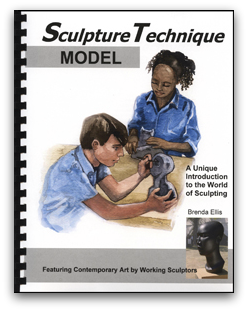 So that's our review of Artistic Pursuits Sculpture Technique: Model. I hope you enjoyed this review as much as we enjoyed bringing it to you! For more great reviews, check out the Schoolhouse Review Crew!